The Performance Driving Course allows you to appreciate your high performance car, and receive expert training from our team of professional race instructors. You’ll get to experience and learn from professionals while lapping on a real racetrack, with no stoplights, and no speed limits. The Jim Russell Racing School has developed the Performance Driving Course as a way for drivers to better understand their vehicles performance and explore its limits while improving their own driving techniques and skill. This program combines driver education, car control exercises and on track lapping. It is the perfect opportunity for those who love driving and want to become expert drivers in their own high performance cars. 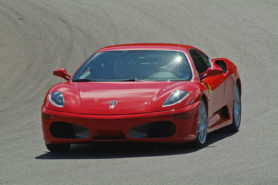 Those successfully completing the Performance Driving Course are eligible to participate in Performance Lapping Sessions. For students interested in obtaining a competition license, the Performance Driving Course is the first of a three step process needed to receive certification for an ASN CANADA FIA affiliated regional competition license. To become eligible, drivers must successfully complete the Performance Driving Course and a minimum of two (2) Performance Lapping Days, the next step.